Homeowners planning to replace their garage door may find a number of insulated options on the market today but fewer options when it comes to green and eco-friendly. This is still a developing market, our advice is to follow the below steps if you're interested in getting your garage door as green as it can be. Energy efficiency is one step to take - in this sense, the more insulated your door is, the better. Metal doors are usually better insulated than other materials. The insulation materials are placed in between two layers of metal and can reach a higher R-value efficiency rating this way (the measure for insulation). Although wood door panels do not frequently come with a higher R-value (they are usually around R-4), it is possible to find wood doors made of composite timber, meaning they are more eco-friendly. Some manufacturers also use timber waste or man-made forests. Glass doors are insulated, too and since they allow the penetration of sunlight, can help you in cutting down energy on heating. It is possible to source solar garage door opener today. Instead of an electric one, you'll need to rely on the power of the sun. The energy collected from the sun within a few hours can last for approximately three days. These solar systems have a storage battery, which stores the energy of the sun in order to power the opener or for the cloudy days when the sun is hiding. 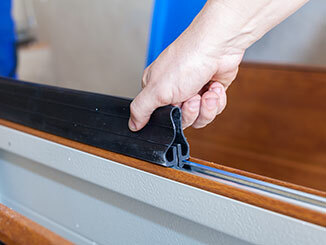 Ensure the weather strips you use are of high quality, and if you've got a glass garage door installed, ensure the frame has a weather-resistant retainer and bottom seal in place. There are many weather seals on the market today but you might get a higher level of insulation if you place retainers, then insert the weather seal pieces in them. It will also be easier to replace the seals this way. If you're planning recoat or repaint your panels, be sure to source ecologically friendly substances. These will be much better for the environment and for your health. Don't forget that you'll breathe in the toxicity of non-ecological varnishes and that's definitely not a good thing for your health!